Aluminum isn’t just a fantastic material for food-wrapping foil; it’s also a premium product used to create fences for residential, commercial, and industrial building purposes. Why, you ask? Well, aluminum is a popular fencing choice for several reasons. 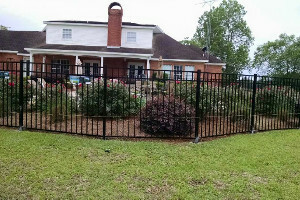 Aluminum fencing carries a beauty and elegance that resembles wrought iron fencing, but it doesn’t require wrought iron’s extensive and regular maintenance. It comes in a variety of styles and colors, and it can be used in virtually any outdoor area from bordering the front yard to barricading a swimming pool. To top it off, you'll need a professional fencing construction company to handle it. Aluminum fencing is versatile. It can be used on flat or sloped land without causing unsightly gaps in between fences. Our aluminum fencing products are available in an array of different designs. If you aren’t sure which design is best for you, our manufacturer can custom design a unique aluminum fence to fit your needs. Aluminum fencing is low-maintenance. As durable as a high-end metal fence but much less expensive to keep in shape, aluminum fencing is great for anyone who wants a beautiful fence with little fuss. Aluminum won’t rust or break easily, and it’s easy to clean as well. Aluminum fencing is long lasting. Most aluminum fences can outlast their wood and steel counterparts. They won’t rot, corrode, or fade, and they can withstand the elements. Because of this longevity, most quality manufacturers offer a lifetime warranty on aluminum fencing as a sign of quality assurance that professional decorative fencing companies pass on to their customers. Aluminum fencing is affordable. As strong as steel but as elegant as wrought iron, aluminum is considerably cheaper than both steel and iron because it is readily available and costs less to manufacture. Aluminum fencing is environmentally friendly. Several kinds of aluminum fences these days are made from mostly recycled materials, costing relatively little energy to make. This doesn’t compromise the fence’s quality, however, as most of the recycled materials also come from used aluminum. Aluminum fencing provides modular wall fencing. Aluminum fences are used to barricade pools that follow standards and local codes. They can easily be molded to a certain height and even topped with spikes to prevent breaching.